Finding a bunk bed that’s not just for kids can be a difficult task. Full-over-full bunk beds are the perfect size for any person, big or small. We know researching bunk beds can be a snooze, so we took the time to research and review all the bunk beds that are great for any house or vacation home. No need to hit the snooze button, we’re alarmed and ready with our top ten favorite bunk beds for you to choose from. Choosing the best full-over-full bunk bed is easy once you know what you’re looking for. After researching through many a full-over-full bunk bed review, we found a few things you should look for when choosing the perfect bunk bed for you. Here is a list of a few features to look for when buying your bunk bed set. Material: The material that your bunk beds are made of is important for many reasons including stability and durability. The most common materials for bunk beds are wood and metal, both of which are great for longevity. Drawers: Storage in bunk beds is sometimes hard to find. Finding a bunk bed setup that includes drawers will help you make up the space the beds take up in your room. Look for the number of drawers to help you decide how much storage you really need. Access: Depending on who will use the bunk beds, access is everything. For older adults, stairs are much easier to work with than a ladder. Be sure to consider your users before you move in on a bunk bed! Finish: The finish of a bunk bed set may be a make or break type of feature for you. You should check the finish and color of each bunk bed set to help you match your current decor without clashing. Dimensions: Not every size bed will work for your space. Be sure to measure your space and check the dimensions of the bunk bed of your choice before purchasing. You can ensure you won’t have buyer’s remorse if you double check the dimensions. Warranty: You should make sure your latest investment in your new bunk beds is covered in case of defect or injury is important. Spend a little time looking over the warranty so you know what’s covered and what’s not in case you come across any problems. Now that you know exactly what to look for in a quality bunk bed, we’ve made a list of our top 10 full-over-full bunk beds for you to peruse. Our top pick and budget pick are our two favorite options, but we also have a great array of other bunk beds for you to choose from throughout this buying guide, too. Are you ready? Here we go! We chose the Coaster Home 460078 Bunk Bed as our top pick because it gives you a ton of space for sleeping and all the stability to hold up to four people. 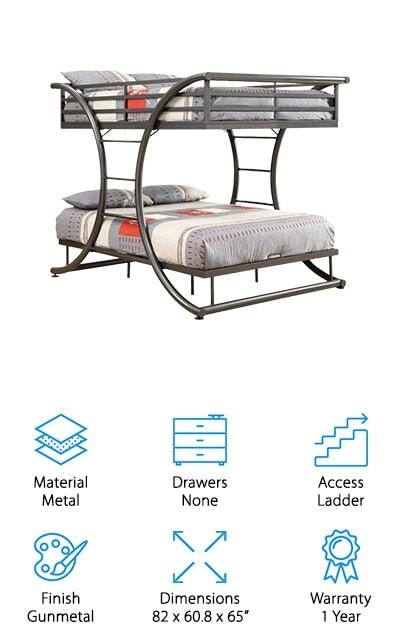 This bunk bed is made out of metal and has a gunmetal finish. Although this doesn’t have any drawers, you’ll find that there is plenty of room to tuck and store a few items underneath the bottom bed. You will need to assemble this bed, so be sure to grab a friend before you get to work. To get into the top bed, you can access it through two ladders on either side of the bed. The max weight allowed in both beds is 400 pounds. The beds cannot be separated, but with its strong structure you shouldn’t be worried about injuring the bed. We love the Coaster Home Bunk Bed because it’s not bulky and also gives you everything you are looking for in a bunk bed. The Acme Furniture Bristol Bunk Bed is our budget pick because it’s an affordable bunk bed with all the features you need. This bed also has a gun metal finish to give you a sleek and simple look. You’ll use the ladder to access the top bunk. If you need to move the ladder to one side or the other, you can do so as it’s reversible. Each bed has a slat system to keep the beds from falling out. The mattresses are not included, so be sure you have two on hand after set up. Setting up this bed will take a few hours, so be sure to set some time aside once the boxes arrive to set it up. The top bed is protected with a full-length guardrail so any person who sleeps up there can feel safe and comfortable. The bottom line is: if you’re looking for a great, affordable full-over-full bunk bed you’ll be smitten with the Acme Furniture Bristol Bunk Bed. The Coaster Full/Full Bunk Bed is another great choice. Made from metal with a white finish, this bed fits in nicely with any decor. Compact and simple, this bed will fit in any space but especially rooms where the space is tight. 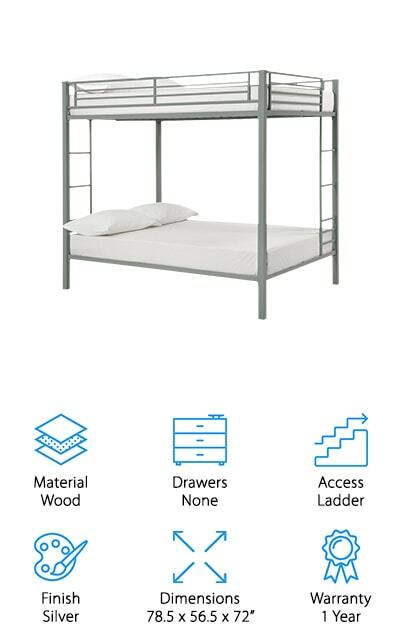 If you’re concerned with safety, this bed comes with guardrails and two ladders to get you up and down the bed safely. The bed holds up to two adult couples comfortably, but kids will love this set up, too. Assembly is required, but you can also have an expert set it up for you if need an extra hand. If you choose to set it up on your own, you and another adult can easily set it up within a few hours. 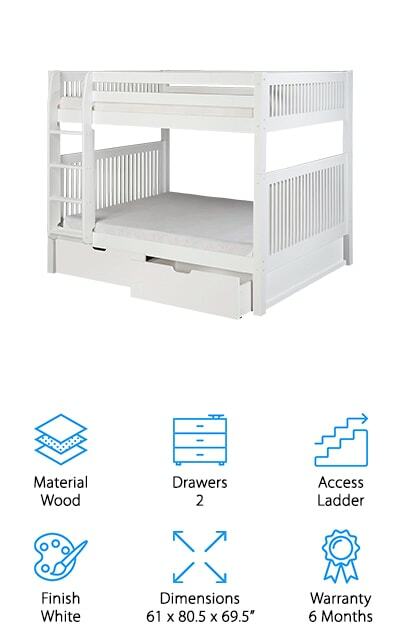 If you’re looking for a compact full-over-full bunk bed set up, this Coaster bed has it all in a smaller space but doesn’t lack any of the essentials for a safe and sturdy bunk bed. For the adults who have a difficult time with ladders, the Bedz King Stairway Bunk Beds are one of the best options. This bed is much larger than many of the other beds we’ve listed, so a bigger space is needed for this particular bunk bed. This bed also has a ton of storage with 6 drawers and a few shelves on the end. The ladder is reversible, meaning you can switch it from one end to the other to fit it in your space. The cappuccino finish gives this bunk bed a classy look and is child-safe. Made from Brazilian pine wood, not particle board or MDF, this bed is sturdy and strong with a weight capacity of 175 pounds on the top bunk and 200 pounds on the bottom bunk. You will have to assemble the bed, but all tools and instructions are included. 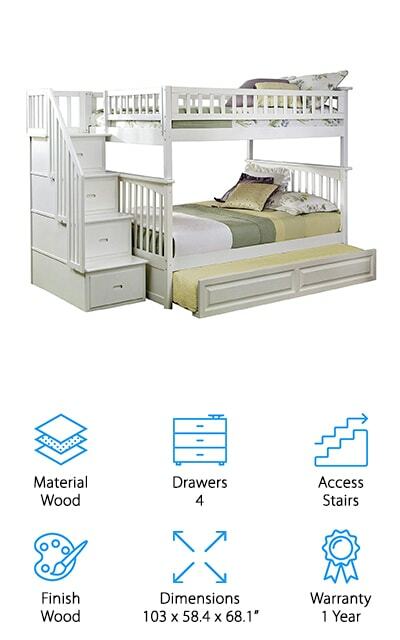 For those of you who want a bunk bed with stairs, the Bedz King Stairway Bunk Beds have all the bells and whistles you need to sleep in peace! The Atlantic Furniture Columbia Bunk Bed is the ultimate full-sized bunk bed setup. It’s made from eco-friendly hardwood with a five-step finish to secure the white color. Both top and bottom beds accommodate 9.5 inch thick mattresses both of which are supported by a strong slat system. This bunk bed system can be converted into two separate beds if you need to move the beds from one room to another. You’ll have 4 drawers to store any clothes, toys, or books. The staircase drawers also come to you fully assembled, so you won’t have to take any time to set them up yourself. The bottom of the bed offers access to a trundle bed, too, for an additional sleeping space when you have company. This bunk bed is perfect for any age, kids or adults, who want all the fun of traditional bunk beds with the safety of a traditional bed! 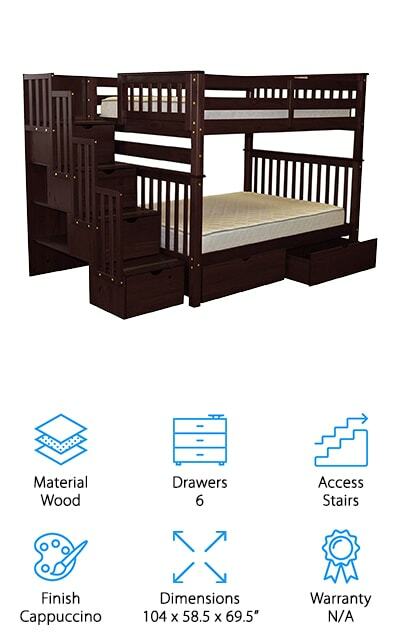 Try out an Atlantic Furniture Columbia Bunk Bed to give the whole family a place to stay. 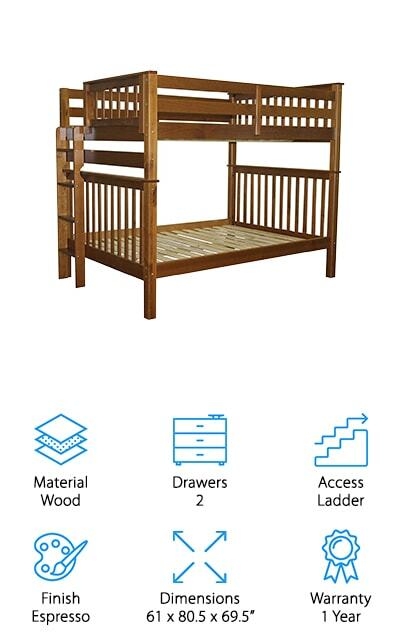 The Discovery World Bunk Bed is a beautiful wooden full over full bunk bed. Compact and perfect for just about any space, these bunk beds are made of solid wood inside and out. The beds can be separated into two separate beds if you decide to split the beds up. The bed pieces come in a large wooden crate with everything you need to put the beds together. Although assembly is required, the manufacturer provides you with instructions to easily set up the beds yourself. Both the top and bottom beds include a slat system to avoid any extra accessories. The mattresses are not included, but any standard full size mattress will do. There are 3 drawers located underneath the bottom bunk that are perfect for clothing or toy storage, making it perfect for children and adults alike. The Discovery World Bunk Bed gives you the right amount of sleeping space and storage space all in one. 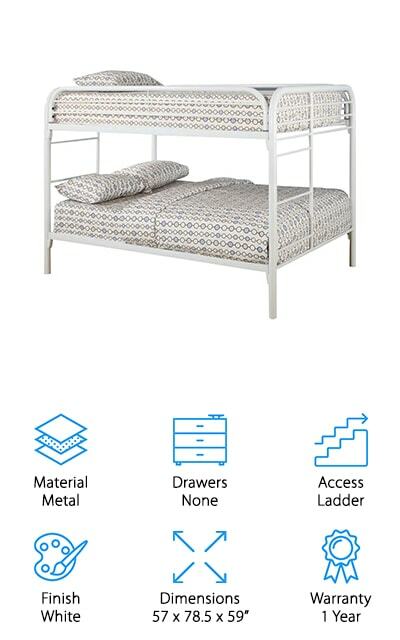 The DHP Metal Bunk Bed is a simple, yet beautiful bed that will fit right in with any space or decor. With metal guardrails, finished with a silver coating, you and all of your guests will be safe and sound as you sleep at night. The DHP space saving design is perfect for any small space including apartments and condos but works well in traditional homes with multiple children. Both beds fit a standard full size mattress, so finding a mattress once the bunk beds arrive should be easy. One tip: the top mattress should be no more than 6 inches thick. You can also order a mattress from DHP to ensure that your mattress fits. With metal slats, each mattress will be supported without any extra accessories. The ladder easily integrates onto the bunk bed, too, so you can be sure that it’s secure and safe for any and all who climb up to the top. 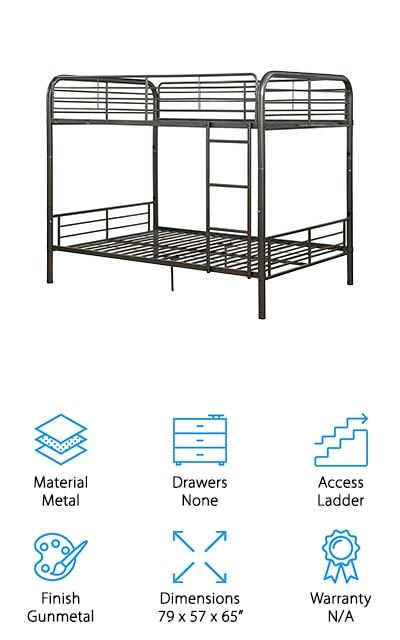 If you’re looking for a strong, sturdy, metal bunk bed, the DHP Metal Bunk Bed is a good choice! The Camaflexi Mission Bunk Bed reminds us of our camp days! Made from 100% all natural and sustainable wood, the look of this bed is one that others will compliment you on every time they come to stay. The wood is also non-toxic so your kids are safe sleeping next to the wood every night. The underbed storage includes two drawers for anything and everything you can fit. The ladder is interchangeable so you can decide which side is best for your surroundings. Both beds hold up to 650 pounds of weight, so any person, child or adult, can sleep comfortably and safely in these beds. The beds are under a 1 year warranty if you have any issues with parts or malfunctions. The Camaflexi Mission Bunk Bed is a quality bunk bed that’s safe enough for kids and sturdy enough for adults. If you’re on the hunt for a great wooden bunk bed, this bed is a wonderful option! Bedz King is back again with another great bunk bed! These mission style bunk beds come in an espresso finish that fits in with almost any style room. The finish is also child safe so never worry about putting your kids to bed again. 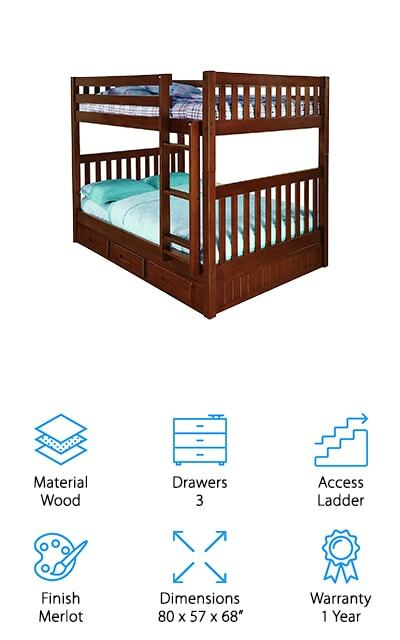 Just like the other Bedz King bunk we listed earlier, these beds are made out of Brazilian pine to give you strength and stability without all the creaking noises. The ladder can be placed on either the left or right side of the bed depending on what your space calls for. The beds can be separated into two full beds if you decide to move them to separate rooms or if your children need more space. Assembly is required for this set of bunk beds, but you’ll find the tools you need to put them together inside the box. The Bedz King Mission Bunk Beds are perfect for any home and hold up for years to come. If you’re looking for the perfect, roomy bunk bed for your kids the Max & Lily Bunk Bed is the one for you. Made from 100% New Zealand Pine Wood, this bed holds up to 400 pounds of rough housing and jumping around. 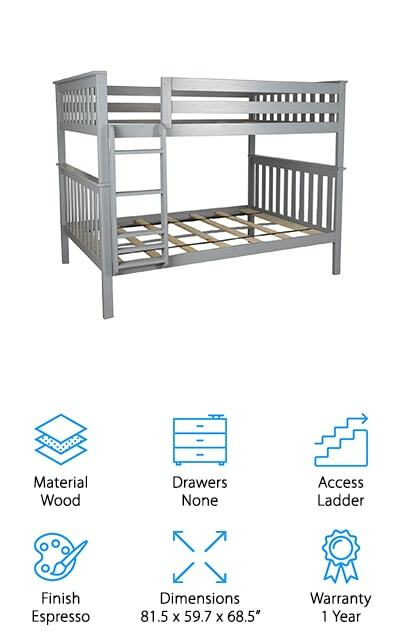 Fourteen inch guardrails will protect your kids from falling off the top bunk. The top bunk fits a standard full mattress size and thickness. The room you put the bunk bed in should have at least 8 feet of space from floor to ceiling to give your kids enough headroom. Although there aren’t any drawers for storage, you can buy a separate mechanism for underbed storage or a trundle bed if you want more sleeping space. You can also separate the beds from each other when the kids grow up and need their own rooms. The Max & Lily Bunk Bed are an excellent choice for kids as it’s been kid-tested for safety, quality, and stability. Save space, headaches, and time when you buy a bunk bed like this!